We all feel like we spend too much time on our phones. Notifications keep nagging us, we need to see what happens on Facebook or Twitter, and we feel a constant need to post to Instagram or chat with our friends in WhatsApp. But do we know how much we actually spend in each of those apps? Yesterday I discovered iOS has a very simple view hidden away in the Battery settings that answers exactly that question. Up to the minute. I now know that in the past 24 hours I’ve spent 11 minutes in Mail, 8 minutes in Slack and 9 minutes with Twitter. Apparently, I mostly check Facebook on desktop because that app only got 2 minutes of my time. More surprisingly is that I’ve spent 18 minutes in Messages too. You too can get this information, if you’re using iOS. 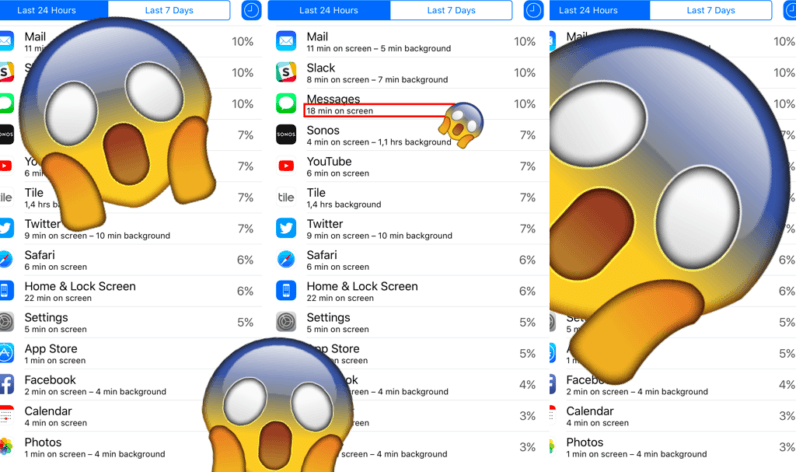 Simply open the Settings app, scroll down to Battery and click that, then wait a few seconds for the app overview to load (you might need to scroll down a bit) and the view you’ll see is your apps sorted by the amount of energy they’ve used over the past 24 hours or last 7 days. Now to the right of the 24h/7 days selector is a small clock icon. If you touch that, your view is expanded and you’ll see the amount of time you’ve spent in all your most used apps. The view is still sorted by battery usage, and sometimes you’ll see two number shown. The first number is the time you’ve actually spent interacting with the app, and the second numbers shows the time the app has been active in the background. The ’13 minutes on screen’ shows you how much time you’ve wasted in that particular app. Useful, right? Now do us a favor and make a screenshot of your own (probably shocking) usage and post it in our comments, or tweet it at us on Twitter.